All the staff at D.S.M. Asbestos Consultants Ltd are fully trained in their various roles. D.S.M. takes great pride in the competency and professionalism of its work force. Operatives taking part in statutory training sessions. Operatives are required by the D.S.M. Consultants Code of Practice to conform to a minimum level of competence before being involved with removal operations. These operatives are taking part in the D.S.M. theory session on the latest wet strip and negative pressure equipment. 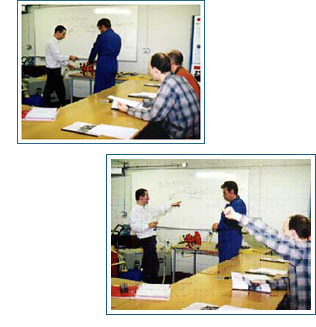 Operatives prior to employment have to undergo written examinations to assess their competence and are involved frequently in the type of training sessions shown here. Wet strip technology at work not only makes the removal operations cleaner but also insures safety to the client, general public and the operatives during and after operations have finished.